Strong, sturdy solid white oak forms the core of this dresser, creating a piece of furniture that can stand up to the occasional knocks and nicks that the average household hands out. Not only is this storage piece heirloom quality, the classically beautiful style of crown moulding and split-turned posts ensures that it can stay relevant in the constant cycle of changing furniture fashions. The Stone Ridge Transitional Solid Wood Drawer Dresser with Nine Drawers by Kincaid Furniture at AHFA in the area. Product availability may vary. Contact us for the most current availability on this product. Finish & Paint Options Light brown is the featured wood finish, with some pieces available in a black painted finish. Case Detail Split-turned posts and crown moulding are recurring motifs in this collection. 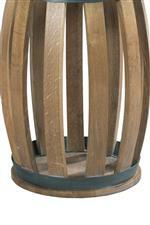 Accent pieces display wine barrel-inspired slats and splayed X bases. Marrying the rich tradition of Tuscany with the fashion-forward and casual look of California's wine country, Stone Ridge is a gorgeous new furniture collection made to exacting, traditional standards. Refined, mature furniture for the modern world, this collection brings you the solid wood craftsmanship you've come to expect with innovative storage and technology features you depend on. The design is inspired by a tranquil tour through wine country. Solid white and French oak wood is used in rustic-inspired pieces, like tables with wine-barrel slats. Dark metal drawer hardware and barn-door sliding hardware adds rustic-industrial appeal, while transitional decor details and a rich, black accent finish plays up the feel of relaxed refinement. Adding dynamic appeal for the modern home, Stone Ridge offers a multitude of functionality features that make your life that much easier. Media chests offer multi-functional storage and wire management, while nightstands and side tables include built-in charging for your mobile devices. Upholstered pieces, like the tufted bed and upholstered dining seats, are available in many customizable colors of durable, stain-resistant Sunbrella® fabric. The Stone Ridge collection is a great option if you are looking for Transitional Traditional furniture in the area. Browse other items in the Stone Ridge collection from AHFA in the area.